Organizations are collections of your users (both end-users and agents). As described in About organizations and groups, how you set up your organizations depends on how you want to define your workflow and organize your users (both end-users and agents). Administrators on Team, Professional, and Enterprise can add and edit organizations, agents cannot. On the Team plan, users can belong to only one organization. On Professional and Enterprise, users can belong to multiple organizations, up to 300. A user does not have to belong to any organization, however. Note: Organizations are not available on the Essential plan. Administrators can add organizations, agents cannot. You can watch this short video about creating organizations or you can read the instructions below. Hover over the +Add tab, then select Organization. Enter the organization's name in the Name field. Organization names must be unique. Enter Email domains (separated by a space) if you want to set up user mapping. When you set up user mapping, users from these email domains will be automatically added to this organization when they submit a request for the first time or register. Note: Note: When you add a domain to an organization, that domain is handled as if it has been added to your whitelist, and overrides the blacklist. Any blacklisted users from that email domain will have access to Zendesk Support. You can add additional information after clicking Save. For more information about organization tags, see Adding tags to users and organizations. Select a Group if you want to set up group mapping. When you set up group mapping, an organization's tickets are automatically assigned to the specified group. This can be set up by an administrator. For Users, determine their ticket access. This setting only affects Guide Professional, where end-users can access tickets in the customer portal. Important: There are organization access settings in the user profile and in the organization itself. If the settings are in conflict, the more permissive setting overrides the less permissive setting. Select Can view own tickets only if you want users in this org to be able to view and edit their own tickets only. Note: If you chose this setting, but the access setting in the user's profile or custom role gives the user access to all org tickets, this org setting will be overridden by the user setting. Select Can view all org tickets if you want users in this org to be able to view all org tickets, then select And add comments or but not add comments to determine whether they can also comment on org tickets. Allowing all of the end-users in an organization to see each other's tickets is referred to as a shared organization. Note: If you chose this setting, and the access setting in the user's profile or custom role restricts access for users in the org to their own tickets only, this org setting will override the user setting. Enter any Details or Notes you want. The new organization is saved automatically, so when you are finished you can simply navigate away. Click the Admin icon ( ) in the sidebar, then select People. On the People page, click Organization. Users can be automatically added to an organization based on their email domain when they submit a request for the first time or register. A user must verify their email address before it is automatically added. This is referred to as user mapping and an administrator can set this up by editing an organization's settings. Click the Admin icon ( ) in the sidebar, then select People. Find the organization you want to edit and then click Edit. Alternatively, you can search for the organization. In Domains enter the email domain(s) (separated by a space) to set up user mapping. Your update is saved automatically, so when you are finished you can simply navigate away. A user must then verify the email address for it to be added. If you've added email domains to the whitelist (see Using the whitelist and blacklist to control access to Zendesk Support), these domains will be automatically included in the list. Although whitelisted domains are included, they are not shown on this organization settings page. Removing the domain mapping will also remove all users who were mapped because of the domain. An organization's tickets can be automatically assigned to a group. This is referred to as group mapping and can be set up by an administrator. Select a Group from the drop-down list to set up group mapping. Your update is saved automatically, so when you are finished you can simply navigate away. New tickets will now automatically be assigned to the selected group; however, business rules and agents may override this default group setting. You have the option of allowing all of the end-users in an organization to see each other's tickets. This is referred to as a shared organization. This can be set up by an administrator. 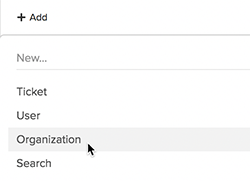 Find the organization you want, then click Edit. For Users, select Can view all org tickets, then, if you want to allow users to add comments to shared organization tickets, select And add comments. Important: This organization-wide setting overrides the user access setting in the user profile. Meaning that, even if you restrict a user in this org to view their own tickets only, they will be able to see all org tickets if the org access is set to view all org tickets. Alternatively, instead of allowing all end-users in an organization to see an organization's tickets, you can grant this privilege to select end-users. To do so, set the org to Can view own tickets only, then set individual users to Can view all org tickets in their user profiles. The user permission in that case overrides the organization-wide setting. You can edit an organization's settings or delete an organization as needed. You must be an administrators to edit or delete organizations. Note: When you delete an organization, any business rules you set up using the organization you deleted will no longer function properly. Make any edits you'd like. Your updates are saved automatically, so when you are finished you can simply navigate away. Click the Organization options arrow in the upper right, then select Delete. Confirm that you want to delete the organization. Any users you assigned to the organization will no longer be assigned (since it doesn't exist anymore) and the organization will be removed from any tickets it was assigned to. Any business rules you set up using the organization you deleted will no longer function properly. You can add users to an organization at the time they are created or later by editing their profile. You can also include users' organizations when importing new users in a bulk import operation. Administrators and agents can add users to organizations. On the Team plan, users can belong to only one organization. On Professional and Enterprise, users can belong to multiple organizations, up to 300. Click End-users (or Administrators, or Agents). Find the user you want to edit and then click Edit. Alternatively, you can search for the user. Select an organization from the drop-down list under Organization. Your update is saved automatically, so when you are finished you can simply navigate away. You can change the user's organization at any time by editing their profile. End-users cannot change their own organization (administrators and agents can). If you are on Professional or Enterprise and add users to multiple organizations, see Managing users in multiple organizations. One of the options you have for managing the ticket workflow and controlling the access agents have to tickets is to add them directly to an organization and then restrict their access privileges to that organization. You must be an administrators to set this up. If you are on the Enterprise plan, you can restrict access to an organization for all agents in a custom role, but you cannot restrict access on an individual agent level. See Creating custom agent roles. To restrict agents in a custom role to an organization, create or edit a custom role and set ticket access to Requested by users in this agent's organization. You can restrict a custom role to one or multiple organizations. On Team and Professional plans, when you restrict agent access to tickets within their organization, those agents can no longer update end-user information or add end-users to tickets, and cannot view end-user information on the People management page. Find the agent you want to edit and then click Edit. Alternatively, you can search for the agent. In Organization, add the name of the organization, if there is not already one there. If you are on the Professional plan, you can add more than one org, if you want to restrict the agent's access to multiple organizations. Regardless of the groups they belong to, agents will only have access to the organization's tickets. Note: Notwithstanding ticket access restrictions, CC'ing an agent on any ticket lets the agent receive email notifications of all public and private updates to the ticket. You can use organizations when creating views (as well as business rules). For example, a common use for organizations in a view is to monitor ticket activity. This view displays unsolved tickets that are assigned to an organization called Customers. If I have an organization whose domain is abc.com, and I enter abc.com into the "auto-add users to organization" list of domains, and we have another organization whose domain is subdomain.abc.com with the same setting - will the initial abc.com (created first) soak up those subdomain.abc.com or will they fall through to the later group? Unfortunately I cannot change the structure of our organizations or the names - they come from SalesForce. Thanks for reaching out. I just tested this in my account, and the domains match exactly. I set subdomain.domain.com as the domain mapping in one organization and domain.com in the second organization. When I created a new user with the email address user@subdomain.domain.com, he was added to the first org and a user created with email address user@domain.com was added to the second. Hope this helps! Let me know if you have any more questions. It would be nice if we could give permission to agents to add organizations. This doesn't make sense to me to be restricted to administrators. In most small businesses, the administrator is going to be the business owner who is the last person who should be worried about putting customers into the appropriate organization. Although this HC says that "Administrators can add organizations, agents cannot" and that "Administrators on Team, Professional, and Enterprise can add and edit organizations, agents cannot", it seems that the option is available for agents too under the People section. It's called "Can add or modify groups & organizations." Could anybody update the article to reflect this? I'm not sure I quite understand what you mean here. Are you talking about custom user roles? If so, it's possible to create a custom role with the ability to add and edit groups and organizations, but custom roles are only available on the Enterprise plan. For all other plans, and for the standard roles that are included in Enterprise out of the box, agents are not able to add or edit organizations. Agents can add users to existing Organizations. It's just that the Organizations themselves will need to be created by an Administrator. Once your workflows are established, Organization creation is potentially not something that's going to come up all that often. Is there something in your workflow that's working differently? For users are you referring to agent or end users? Most often, end users are managed in organizations and agents in groups in Zendesk. With groups you can then manage access to tickets and control what agents have access to based on group membership and how tickets are then routed to groups. If end users, you can control ticket access in the organization profile. In the organization profile there is an option that allows users in the org to see tickets in their org in Help Center end user portal. Thank you. I am looking to restrict access to agents. We have agents assigned across groups. So at group level, it might be tricky. Can we restrict access at Ticket level, where we can assign access to agents by passing groups? At this time it is only possible to restrict agent access to tickets based on the group membership and the ticket being in that agent group. Unfortunately access permissions are not granular enough at this time to filter at the ticket by ticket level. The best option would likely be setting up agent groups as needed; then setting agent permissions in the user profile to only allow access to tickets in the agents' group. You can also create triggers to ensure incoming tickets are routed to the correct group. Thank you for the quick resolution. Qsn. If I choose to set up agent groups to restrict access, then would someone outside the group be able to see the ticket by typing the Ticket# in search? We are dealing with sensitive tickets: Claims/Dispute and resolution. When agents can only access tickets in their group, search only returned tickets they have access to. All other tickets will be hidden; if they search a specific ticket number they do not have access to it will treat the search as the number itself not a ticket number and if they go to the url subdomain.zendesk.com/agent/tickets/### of a ticket they do not have access to, it will error and say "access denied." Can you create an organization straight from a ticket, or chat client? We need to manually create an organization everytime when we could do it just from the chat client and the old Zopim API. Is there a way to give an individual end-user permission to not only view all tickets from their organization but to also edit any ticket from their org? We will typically have customers who want their admins to be able to view and edit all tickets from their org, but they do not want any other users int he org to have this ability. Is there a way to suspend or deactivate Organizations. Our merchants need to be suspended because they do not want to renew their contract. However, we do not want to lose the tickets or information associated with the merchat. We would like to be able to suspend them. Let me know how I can do this. When you've set up an Org so that end-users can see all the tickets in that Org, you'll get the option to allow those users to also add comments to those tickets. This setting applies to all end-users in that org; it's not possible to restrict it so that all end-users can see the tickets, but only certain ones can add comments. I hope that answers your question! I'd like to see more nuanced role controls in regards to Org. Currently, there is only one checkbox to determine whether a role can add or modify Groups and Organizations. I would like to allow certain agents to edit our Org fields, but do not want to give the ability to provision new Orgs, nor to add/edit Groups. Let me know if you'd prefer this in a separate thread. There's no functionality to suspend an Organization, only users. What's your use case here? Do you need to keep agents from using these Orgs, or is there something else you need? We might be able to come up with a work-around of some kind. Is it possible to create a view based off of an organization tag? Tickets from a specific Organization automatically inherit that Org's tags. So all you need to do is set a condition in your custom view that tests for Ticket: Tags > includes at least one of the following > your Org tag here. Is there a way to create a view by organization field? Example - I have a field under Organization for "Country". Can I create a view to see all tickets for all organizations in Singapore? If using a drop-down field on the organization, you could use the associated tag in your view conditions. So for all tickets created by an organization in Singapore, the 'singapore' tag should be added. Then you can filter your view by all tickets tagged with Singapore. Thanks James! So the tag needs to be added upon ticket creation, right? it is not automatically added, no? Organization tags will automatically be added to the ticket upon creation and also update. I did write up the use case, and there has not been any response since March. Can we please get some eyes on this request? Thanks for sharing that great use case! Our Product Managers definitely see every post and comment in Product Feedback but, since they have a finite amount of time they can spend in the Community, they tend to focus on posts related to areas of the product they're actively working on. They just don't have the bandwidth to respond to everything, even though they'd like to. So, what happens if we have two organisations with matching names? It's not actually possible to add an Organization with the exact same name as an Org that already exists. That said, if there are minor spelling differences between two Orgs that have very similar names, I can see where that would lead to confusion. Each Org you create is actually give an Org id number (which you can find in the URL of the Org page in the agent interface), so that can help to differentiate in cases like that. Can I increase the number of displayed views?